Last night Price and I went to lecture about City Center, MGM’s latest project in Vegas, at Harvard’s Graduate School of Design (GSD). 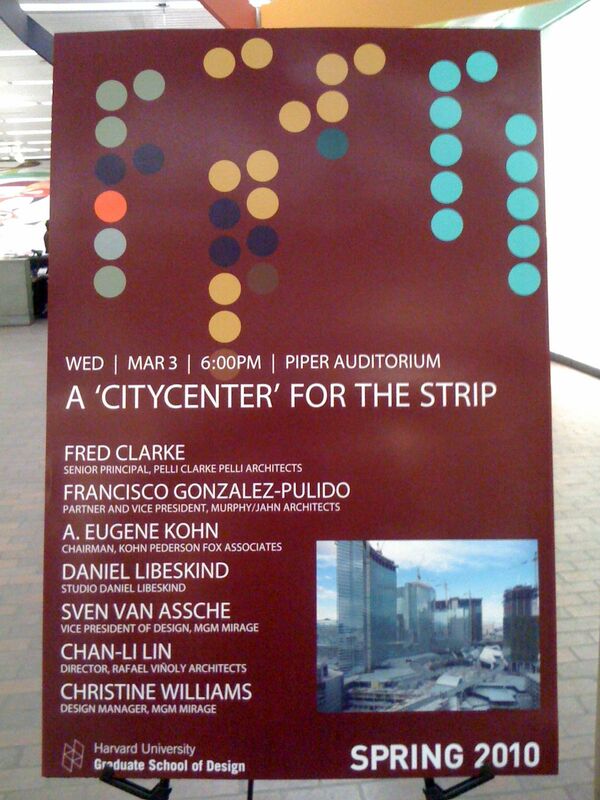 I was interested in this lecture because Gensler was the executive architect for the project. It was a huge collaborative effort, that Gensler managed, between several large famous architectural firms, landscape design firms, interior designers, and consultants. This was a HUGE project~ 18 million square feet and $8.5 million dollars~ so I wanted to hear about the design process and how it came together. This really is a turning point in Vegas. City Center is not the typical kitch that you see in vegas- no pyramid, no eiffe tower, no statue of liberty, no volcano with shooting flames. This is a beautiful center that can redefine what Vegas architecture will be. 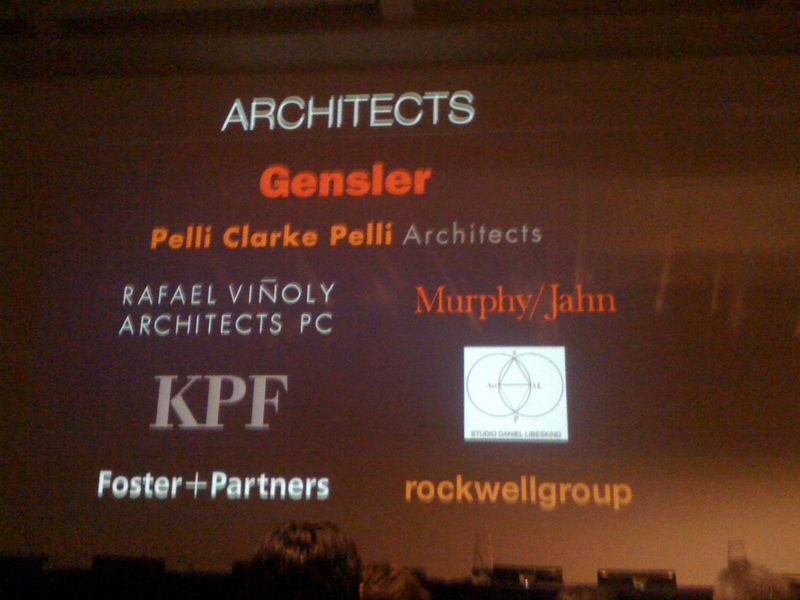 Aside from Gensler’s participation, I wanted to see the lecture because of the panel of architects there. Umm anyone heard of Daniel Libeskind? Even if you don’t recognize the name, you can recognize the work from the Jewish Museum Berlin in Berlin, Germany, the latest addition to the Royal Onterio Musuem in Toronto, ON. 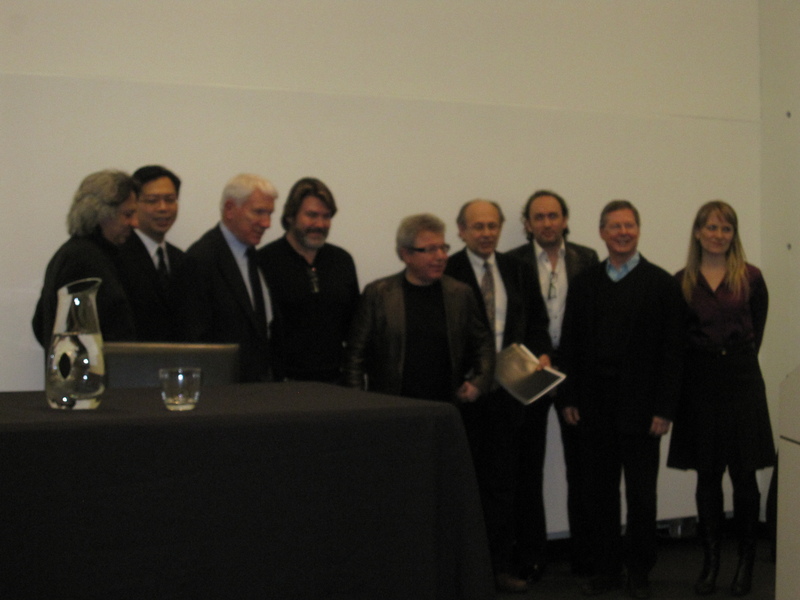 I could not miss a lecture with Libeskind, Clarke, Gonzalez-Paulido, Kohn, and Lin. This is a who’s who of famous firm founders/partners. Sure, they are just regular people, but famous architect people. It’s like getting coffee when Art Gensler (a founder of Gensler) is also in the pantry during a visit and the only thing I can think of is ” Don’t spill! Don’t trip! !” (I have fallen while carrying coffee before- I tore up my knee pretty well too). So Price and I settled in for the 2 hour lecture about how it was to design, work, and collaborate on City Center. It was interesting to have the client and the architects there so you could hear what the client really wanted and how the architect filled their needs. 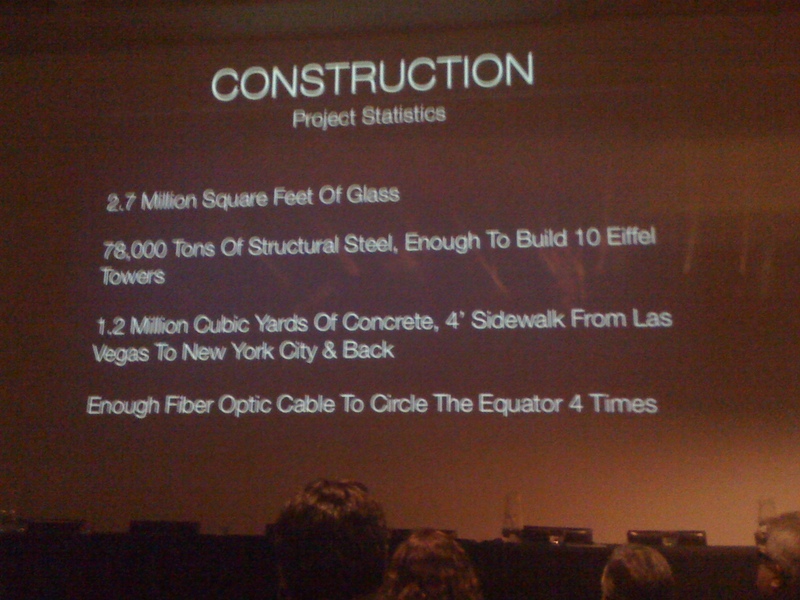 MGM had a pretty clear idea of what they wanted and with master planning finalized the program and spaces to then work with architects to design each of these pieces, from the casino and hotel of Aria, high-end boutique (400 room) hotel of the Mardarin Oriental, and the high-end shopping center called Cyrstals, etc. I think that the lecture went well but I think that there could have been some plans to show the scale or the overall spaces. The renderings were great but there is something about a line drawing that can also tell you a lot. The panel discussed some pretty in depth things, like Francisco Gonzalez-Pulido answered questions regarding the use of curtain wall systems. While all the projects are different materiality they are similar and Gonzalez- Pulido explained how the projects using curtain wall systems allows this to happen. When they were designing Veer, a condo towers, they turned to the curtain wall systems because of their efficiency, which would help them obtain the LEED Gold they were striving for. 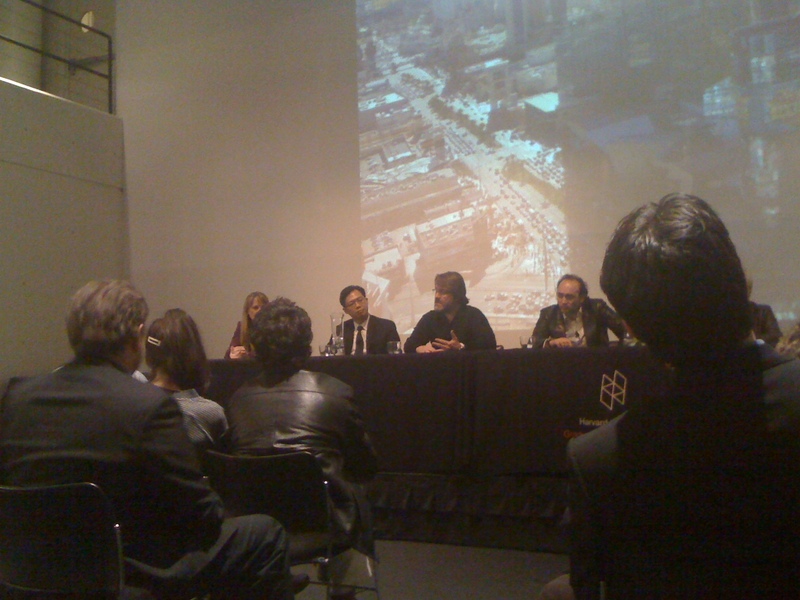 Overall questions and comments from the audience were positive there was 1 GSD student who had a holier than thou complex and started to ask if they feel as architects they should create spaces that are improving the human condition, instead of creating a space that emphasizes capitalism and commercialism. I think that they handled the question well by explaining they were designing for their audience- the touristy person who is coming for an escape. Sure they can’t afford the pricey Louis Vuitton bag they can still enjoy the space they are in. In all it was fun to go to because it was interesting to heard about the program, process, design intent, materials, and to hear from these world-class architects. Sorry for some crummy photos- I’m an idiot who could not find her camera in her purse because it was in my coat pocket that I was carrying around. So I used my iphone and ended up finding my camera at the end. So dumb. The Harvard GSD lecture schedule can be found HERE.